A few weeks ago, my hubby and I decided to start working out on a regular basis to get in better shape. The workouts have been great, but getting into a new routine is taking some time. Losing the weight is also taking some time. We are sticking with it, and I know it will pay off. The yoga video that I have had for years decided to give out on me and would not play anymore. 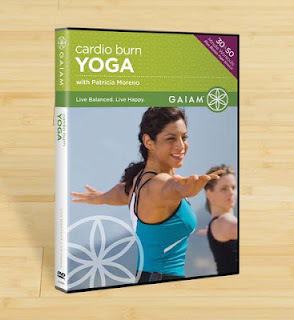 I saw this Cardio Burn Yoga at Half Price Books and decided to give it a try. Let me tell you; the title says it all. You will feel the burn, sweat, and use muscles you never knew you had. It is wonderful! The instructor, Patricia Moreno, combines yoga poses with a rhythmic dance like choreography. If you are looking for a low impact cardio workout, then try this type of yoga. Let me know your thoughts. This post was not sponsored by Gaiam or anyone else. All thoughts and review of product are based on personal experience.